Many Simpson Strong-Tie connectors have been designed and tested for use with specific types and sizes of fasteners. The specified quantity, type and size of fastener must be installed in the correct holes on the connector to achieve published loads. Other factors such as fastener material and finish are also important. Incorrect fastener selection or installation can compromise connector performance and could lead to failure. For more information about fasteners, see our Fastening Systems catalog or access our Fastener Finder software. The Simpson Strong-Tie® Strong-Drive® SD Connector screw is the only screw approved for use with our connectors. The allowable loads of stainless-steel connectors match those of carbon-steel connectors when installed with Simpson Strong-Tie® stainless- steel, SCNR ring- shank nails. For more information, refer to engineering letter L-F-SSNAILS. 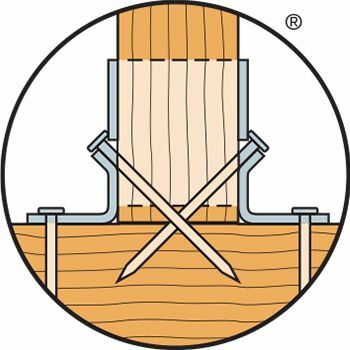 In some cases, it is desirable to install Simpson Strong-Tie face-mount joist hangers, post basses and caps, and straight straps and with nails that are a different type or size than what is called out in the load table. In these cases, these reduction factors must be applied to the allowable loads listed for the connector. Allowable load adjustment factors shown in the table are applicable to all face-mount hangers, post bases and caps, and straight straps throughout this catalog, except as noted in the footnotes below. Some products have been tested specifically with alternative fasteners and have allowable load adjustment factors or reduced capacities published on the specific product page. Values published on the product page may be used in lieu of using this table. 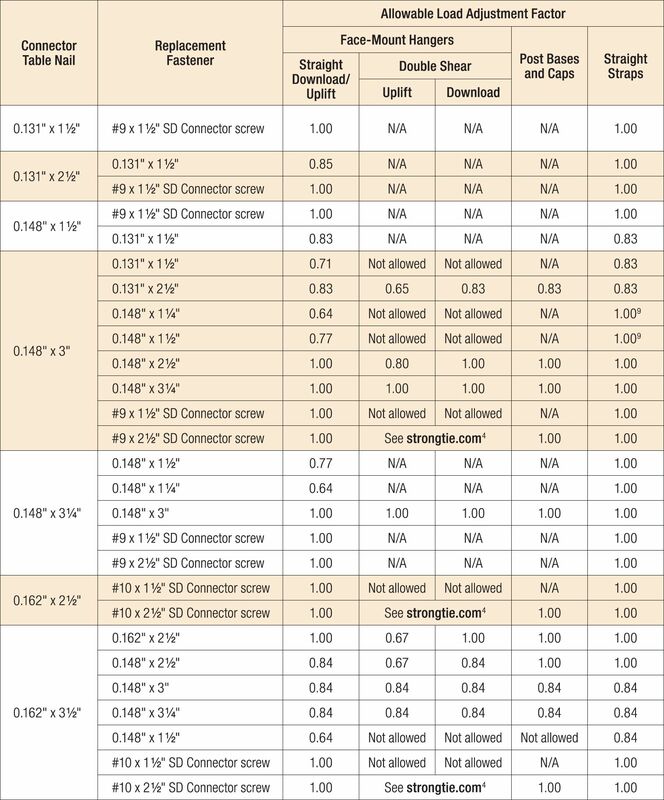 This table does not apply to SUR/SUL/HSUR/HSUL hangers or to hangers modified per allowed options, or to connectors made from steel thicker than 10 ga..
Strong-Drive® SD Connector screw substitutions in this table do not apply to sloped, skewed, or double-shear hangers. Strong-Drive SD Connector screws may be used in these connectors. 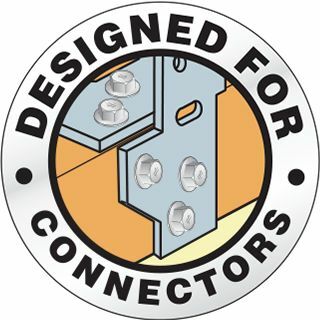 For additional information and specific allowable loads, refer to Strong-Drive SD Connector screws. Nails and Strong-Drive® SD Connector screws may not be combined in a connection. 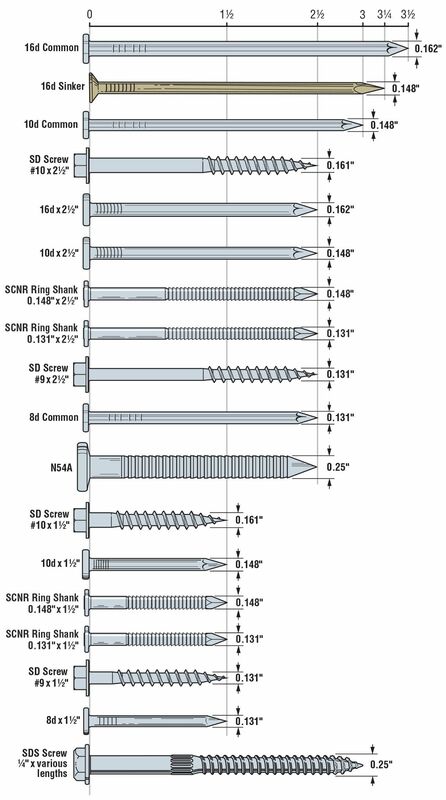 Do not substitute 0.148" x 1 1/2" nails for face nails in slope and skew combinations or in skewed-only LSU..
For straps installed over wood structural panel sheathing, use a 21/2"-long fastener minimum. Where noted, use 0.80 for 10 ga., 11 ga., and 12 ga. products when using SPF lumber. Where noted, use 0.92 for 10 ga., 11 ga., and 12 ga. products when using SPF lumber.